You can customize what transactions appear on the ledger. On a patient's Ledger page, click (or tap) View to open a menu. By date - List transactions in chronological order (click the Date column header to specify ascending or descending). By statement - Group transactions according to the date of service. Procedures, claims, adjustments, and payments associated with a certain date of service appear together. Also, a column with the running balance appears. Patient view - List transactions for only the patient. This option is not available if the patient is the guarantor for only himself or herself (the Guarantor View option will be used). 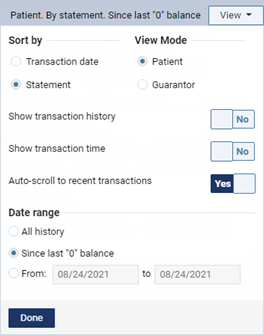 Guarantor view - List transactions for the patient, all patients who have the same guarantor as the patient, and the guarantor (if not the patient). Transactions for a given patient with the same date of service are grouped together. Since last "0" balance - List transactions, starting when the account last had a zero balance. This option is available only if the selected Sort by option is By Statement. Date Range - List transactions only within a specified date range. All history - List all transactions. If you are viewing the ledger by date, to have an Applied and a Remaining column appear to the right of the Amount column, select the Show Applied and Remaining Amount columns check box. For each procedure, the amount of any payments that have been applied to that procedure appears in the Applied column, and the difference between the amount charged and the applied amount appears in the Remaining column. Can we invert the way the dos is presented? Some accounts have a lot of activity and the oldest date is at the top. No, there isn't a way to do that currently. I will add this to the "feature request" forum. Click here to view request. If the patient ledger seems to be incorrect or missing items please check the Ledger > View. The greatest majority of the the items are missing because of the settings here.